Wild Geese conveys tranquility and vibrant energy through the building of layer upon layer of paint—and with it, layers of light, movement, and colour. 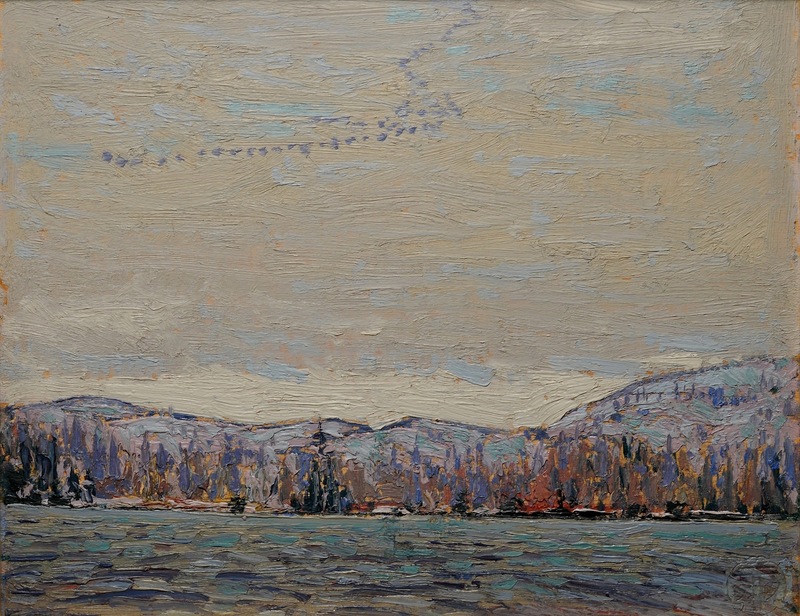 Here, Thomson uses a more muted palette than he does in the fiery canvases that, today, are considered his trademarks, such as The Jack Pine and The West Wind (both 1916-17). Interestingly, a painting of geese completed a year earlier (Round Lake, Mud Bay) captured their flight across the brilliant yellow of a setting sun. Both paintings were inspired by Thomson’s travels in AlgonquinPark, where he devoted much of his time from 1912 until his death in 1917. Though intense, Thomson’s brief artistic career produced a relatively small body of work: roughly 30 canvases and 400 sketches. He came late to the medium of oil painting, seeking advice from his co-workers J.E.H. MacDonald, Arthur Lismer and Frederick Varley after joining the commercial graphic design company Grip Ltd. around 1908. Thomson initially found painting difficult (reportedly throwing his palette in the woods when particularly frustrated). Soon, however, the talented painters he befriended and travelled with, including A.Y. Jackson, Franklin Carmichael and Lawren Harris, would look to Thomson’s expressive, sometimes unorthodox canvases for their own creative inspiration.